The quality of cleaning services directly depends on supplies that are being used by the cleaning company so in this blog post I want to review most commonly used cleaning supplies used every day by us in our regular house cleaning services. These supplies are Review of most commonly used cleaning supplies, such as Clorox-up, Lysol, Mr. Clean, Murphys, Pinesol, Pledge, Soft Scrub, and Windex. 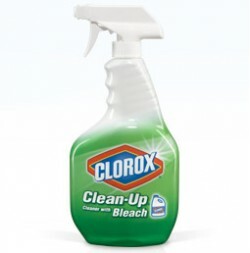 Clorox up multi purpose spray is a great product which you can you mostly anywhere in the home. You can spray off the countertops, sinks, tub, toilets and many other products. The Clorox-up products have bleach in them which is still safe to use around pets and kids but you will get the best disinfectant as well as deodorizing and cleaning the surfaces effectively. This is one great product to use in the kitchen where you have a lot of bacteria from meats on the counter. You will feel safe and secure using Clorox-up in the home knowing everything is sanitary after cleaning with their all in one cleaner with bleach. With so many germs and bacteria's all over many surfaces we touch daily, Lysol is there to clean up what cannot be washed. 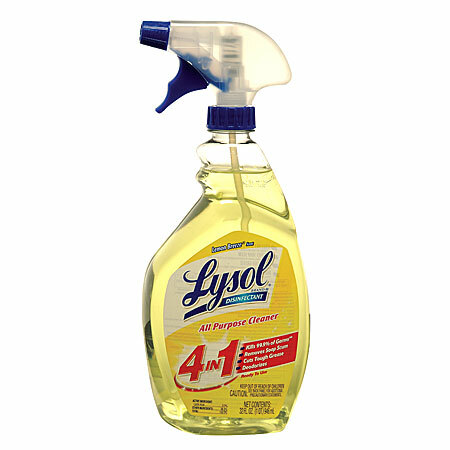 Lysol disinfectant spray can be sprayed onto any type of surface such as toys, door knobs, and other home or office objects to keep the germs down to a minimal. Having children in your house, Lysol is especially one product you should have under your sink. You can clean the objects as well as the air by spraying Lysol throughout your home. This is one cleaner you can feel is secure when it comes to killing those harmful germs that can be spread from person to person throughout the home or even office. 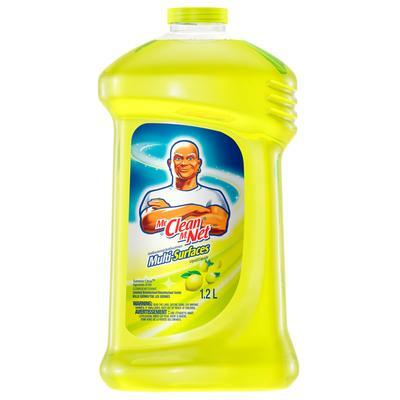 Mr Clean is that one product that everyone knows as the bald guy who makes the home smelling and looking fresh and clean. Mr Clean has many products out on the market such as all purpose surface cleaners, magic erasers, and many more. These products are great to use, especially in homes with children. The magic eraser is just as they named it, magic! They will remove mostly anything off of a surface such as walls, counters, sinks, and many more surfaces in a breeze. Mr Clean has wonderful smelling products which also offer febreeze fragrances which is great for those who would rather have a floral smell than a lemon or pine scent throughout their home after cleaning. Murphy's oil soap has been around for quite some time and this has been one of the products which still are sold strong throughout the world. Murphy's oil is now able to be use anywhere from the floors which they were manufactured to clean from the beginning to the inside of the refrigerator, cabinets, countertops, plastic and wicker products, and many more without damage occurring. It is great to know that a product such as Murphy's can be used on so many different surfaces and still be a great smell. 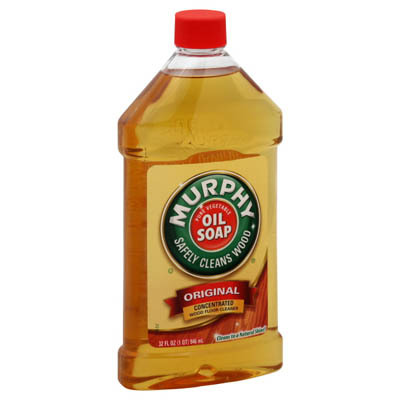 It is better smelling Murphy's wonderful scent, especially when cleaning out the refrigerator rather than having to smell ammonia or vinegar for a few hours throughout the day after the cleaning is done. Pinesol is mostly known to many for the lemon scent or pine scent which were their basic two smells. Now a days there are a few different scents you can choose from but their products work well on floors, sinks, tubs, and even toilets. There frankly is nowhere in the home where Pinesol couldn't clean. 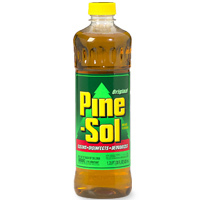 Pinesol is that one cleaner where you can stretch every penny. One quarter cup per gallon of water is one great way to stretch the budget when you are purchasing cleaning products. The only other product you would have to purchase would be glass cleaner. Pinesol will take care of the rest. 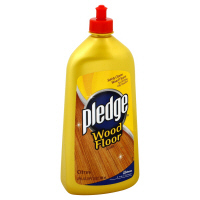 Pledge is that one product we grew up thinking it was only for wooden surfaces. In fact, now a days they are creating multi surface pledge which can go from cleaning your coffee and end tables to spraying off the counter and even the glass surfaces with just one product from Pledge. They have wonderful smells to create a fresh scent throughout your home and you will also feel great knowing that your home does not only smell good but has just been cleansed quite well with the Pledge product. You also can use Pledge on your floor surface even if it is a wood laminate surface for spills and small scuff mark clean ups. 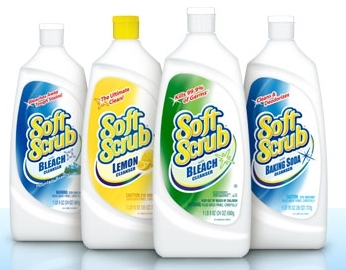 If you are looking for a product to use, especially on the bathrooms surfaces, Soft Scrub is the way to go. Their total bath and bowl cleaners will give you one sparkly bathroom when you are finished with their product. You can go from spraying down the shower stall and having it sit there for a bit to soak to cleaning off the sink and toilet area without having to switch products. Their products have a great smell and they will give you a fresh scent without the harsh chemical smell after you are complete. One plus to this bathroom cleaner is that with the Soft Scrub bottle, you do not have to hold it upright. You can turn it upside down to spray around the toilet bowl and it still will spray with no problems..
Windex is that all purpose window and glass cleaner we all have grown up with our parents and other relatives using. Windex is a great product to use, especially their non-streak substance which is great for those glass doors and of course those mirrors. As you know, you can clean every day but those glass and mirror surfaces, especially for parents, will get quite dirty and smudgy. Windex is that inexpensive product which works wonders and you do not have to worry about streaks and smudges occurring as you wipe off the product. 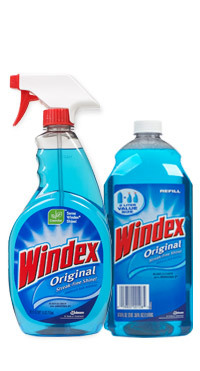 Windex is that one product which will be around for quite sometime and it wonderful.